Well our money’s on Taurus! Which means he or she will need to stay warm in the womb until Saturday 20th April! Until 9.55 am to be precise! After 9.55 am, the Sun leaves spirited Aries and moves into sensual Taurus. And why do we think he or she will be Taurus and not Aries? Well, Taurus is Harry’s Moon Sign. It’s also Prince Charles’s Moon Sign and it’s the Queen’s Sun Sign. So being Taurean would certainly keep that Sign well and truly in the family. The Royal family anyway! There are three major Astrological Signs within a Birth Chart that are very often inherited from parents and grandparents. These Signs have the biggest impact on our personalities. One of these is the Rising Sign which describes the front door to our entire nature. The Rising Sign changes approximately every 2 hours in the course of a day so only an accurate birth time can reveal what it is. Another is the Moon Sign which describes our emotional nature and instinctive responses. The Moon Sign changes every two and a half – 3 days. Then of course there’s the Sun Sign which defines our sense of self. The Sun Sign changes approximately every 28 days throughout the course of a year. We know the Birth Charts of Harry and Meghan. So we might expect their Rising, Moon and Sun Signs to be prominent in the Birth Chart of their little one. But until the baby’s Birth Chart is there to look at, which parent gives what to the child is anyone’s guess! 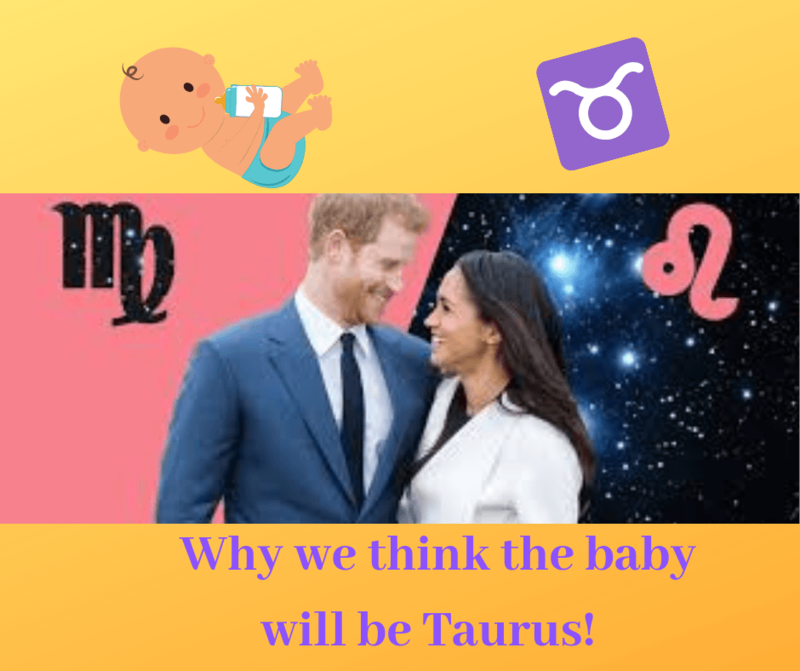 But based on this idea of Astrological Genetics and just for fun, here’s our guesses on possible Birth Days for the – possibly Taurus – royal baby! The Moon is in Sagittarius during those days. Sagittarius was Diana’s Rising Sign. That would be lovely and means the child would inherit Diana’s sense of fun, humour and adventure. Born sometime between 11.49pm on Tuesday 23rd and 10.25 am on Friday 26th. Having said all this, we could be right off the mark! The baby will have the final say on the timing of its entrance! Plus we know nothing at all about the Astrological make up of Meghan’s Mum and Dad. Aries might be a sign that’s very dominant in one or other of their birth Charts in which case the birth may well happen before the 20th April. But we know for sure that Aries is not at all dominant in the Charts of Meghan, Harry, Charles or Diana. All will be revealed pretty soon. Watch this space!